Remember Kathleen Turner in “Body Heat“? Seductive and dangerous. The Pacific Coast Highway is like that. The sweeping ocean views are tremendous and without meaning to, you swerve into the wrong lane while driving because your mind is busy processing the “wow” factor. But is it better than my beloved Atlantic coast? Since I’ve worshiped the miles from Cape Cod to Key West for my entire life, the few hours I spent driving the PCH and darting into a couple of beach communities are not enough to make a final determination. 1. Don’t bring your college-age daughter to Malibu unless you want her to transfer. Visiting the Pepperdine campus, she’ll remember how much fun Jamie Lynn Spears had in “Zooey 101” (before she got preggers), and suddenly decide she wants to surf and wear puka beads. 2. The water is cold. Very cold. Bikinis are fine for the beach but I think you must wear a wet suit to swim. 3. Santa Monica marks the end of the legendary Mother Road, Route 66. Did not know this and also did not know the highway starts in Chicago. I’d always assumed it began somewhere on the east coast. Thank heavens I discovered this tribute on the Santa Monica Pier…which isn’t the end of the road; the terminus is in town at the intersection of Olympic and Lincoln Boulevards. Confused yet? 4. There is such a thing as healthy beach food. Mangoes with lime juice, chili powder and salt are a refreshing alternative to hot dogs, ice cream and funnel cakes. Or, if you’re like me, think of Mexican fruit salad as a digestive supplement to the aforementioned boardwalk crap. 5. I would like to spend a summer perfecting my gondolier skills. Originally developed in 1905 with 16 miles of waterways, the Venice Canal District is charming, even with drought-reduced water levels. And the bars on Windward Avenue are the perfect places to practice singing “O Solo Mio”. 6. Because the sun sets in the west, the light along the coast is tragically beautiful from about 3 p.m. until sunset. Really. It’s gorgeous. I look forward to conducting more research. There are many SoCal beaches to explore: Laguna, La Jolla, Coronado, for example. This may require a convertible and a dye job too. Then I might figure out the answer to another of life’s burning questions: do blondes really have more fun? 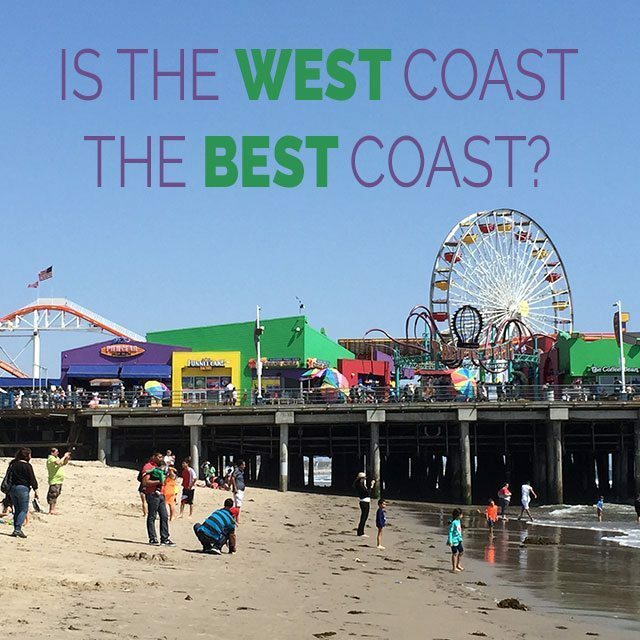 It’s your turn folks – are you an East or West Coaster and why? I expected Gulf of Mexico warmth when I stuck my toe in the Pacific, not glacier cold. Brrrr. So amazing! My mother wants to do a mother daughter trip along the west coast starting in Texas (where we’re from) going along the coast and ending in Oregon. Do it! We had a great time! It’s so much fun to explore new places together and you get to step out of your usual parent-child roles.